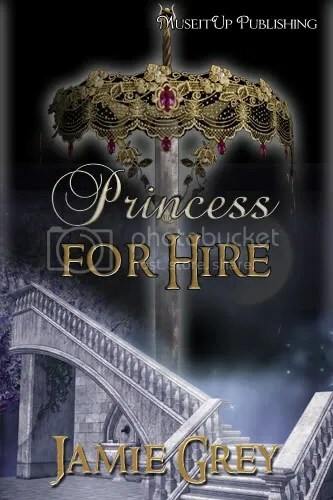 Posted on February 23, 2011, in Author Interviews, Reading Related, Short Fiction, Writing and tagged author interviews, Fantasy, Jamie Grey, MuseItUp Publishing, Princess For Hire, Writing. Bookmark the permalink. 10 Comments. Thanks so much for having me on, Dianna! I’m so excited to be here 🙂 And ready for any questions people might want to throw my way! I’m excited for Jamie! Love to see an author succeed. Jamie, how long was the process from writing the story, editing to finally nabbing an agent? Hi Kim! Thanks for stopping by! I actually started writing the story last March and subbed it to an anthology in May. I made it almost to an offer before they decided to go with another story. So I subbed to MuseItUp in August and heard two weeks later that they wanted to publish! Editing took place throughout the fall and it was ready to go in January – so really it’s been almost exactly a year! Luckily I didn’t need an agent to sub a short story – I’ll be tackling that hurdle this year LOL!! For Jamie … I’m starting out writing and assiduously avoid editing. Can you go into more detail about the process you use for this specific step? How do you keep – er – the momentum through this phase? Best of success with your work! Hi RP! Thanks for the great question! You’ve totally hit on my least favorite part of writing. Editing is hard for me – I’m a perfectionist, so when I see all the flaws in my stories, I tend to get discouraged and want to give up. It’s really hard for me to stay motivated when I see all that work. But I think what helps me most keep my momentum is coming up with a plan or vision (now that the first draft is done) of what I want the story or novel to end up like. What emotions do I want the reader to feel? What sort of tone do I want to set? Then I come up with a project plan – I map out chapters and ways to include those things. I add the things I want to see, the places where there might be a plot hole and how I want to fill it. I use a spreadsheet to keep track, but I know people who use index cards too (one per scene or chapter). And once I start seeing how the final story is going to come together, and I have a plan on what I need to tackle, I find myself getting excited again. Especially when I can see it all coming together. Hi Jamie! Great interview. I love books set in totally different places, whether imaginary or real. How do you do your research for setting (Japan, for instance). Have you been to Japan yourself, or was it all internet research? Hi Laura! I love your question! I would travel every month if I could! 🙂 Unfortunately I don’t have the budget for much, so most of my research on setting so far has been based on the internet, movies and books. When I place stories somewhere I’m not familiar with, part of what I love is really becoming immersed in that place. I’ve found that Google maps and Google world is a great way to get a bird’s eye view, and I really love reading histories and travelogues, as well as watching documentaries to get a real feel for the place. I also look for photography sites as well – even Flickr helps – there’s nothing quite like seeing a person’s every day pictures to get a real taste of a culture. What a wonderful interview! Jamie is my CP and I’m blessed to work with her. She’ll be guest posting on my blog soon – I can’t wait! Your profile is wonderful and honest and I’m so very happy to meet you. I have also faced many emotional difficulties in my life and had a conflicted childhood that I had to heal out of throughout my 20’s. It’s a precious process and yes, writing is so good for it! I’m glad to meet you too; I hope you’ll stick around for a while. In some ways I am unlucky, for I experienced much pain when I was very young; in other ways I am very lucky, because it has allowed me to mature beyond what most people my age have.